Supplied as a 2L plant 40-45cm tall inc. pot, big enough to plant straight out. Everyone knows and loves a Buddleia for their sheer flower power and magnetic allure for butterflies - hence their common name The Butterfly Bush. Here is a new twist on a much-loved favourite - 3 separate colours on one. Our clever growers have skilfully matched 3 different coloured plants - one white, one pink and one purple blue - and grown them close together in one pot. As the plant develops, the stems intermingle, creating a most intriguing mixed colour effect which will get the neighbours talking! Retaining their magical attraction to butterflies, you can look forward to peacock and tortoiseshell butterflies aplenty this summer - and for years beyond. Buddleia is one of the most robust and easy-care shrubs to grow requiring almost no maintenance - we suggest a simple hack back to about 30cm each spring before new leaves appear, but hey, if you forget, it will be fine too! Very hardy, and disease free, grow in sunny spots or large pots. Supplied as a 2L pot, with 3 separate plants growing in, about 40cm tall total, well branched, to plant out and flower this year. Buddleia plants are low maintenance, but they do benefit from pruning in early spring to maintain a nice compact plant. 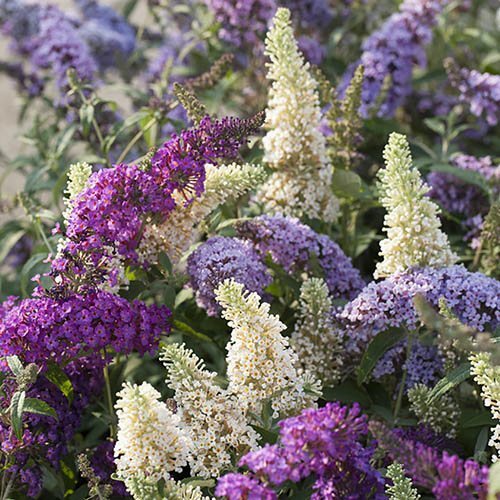 Plant Buddleja in garden borders in any moist, well drained garden soil, in full sun or semi-shade. Alternatively grow buddleja plants in patio containers using soil-based compost such as John Innes No.3. Prune Buddleja in March, once the hardest frosts are over, as the new growth begins to show. Firstly, remove any dead, diseased, damaged, or weak stems, before pruning all off the remaining stems back to form a low framework.